This Santa print was the inspiration for the 2013 Holiday Hutch. I put it front and center where normally a large platter would go. And then built the "hutchscape" around it! 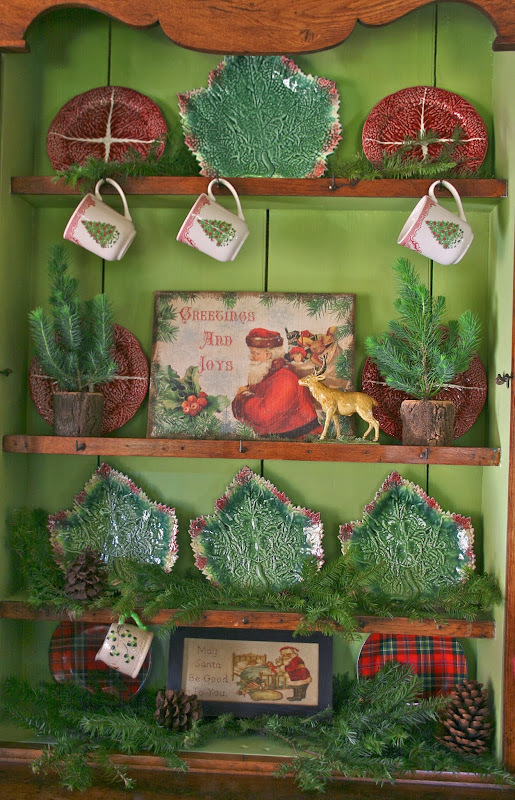 Branches from the Christmas tree lot fill the shelves and those little Christmas trees on either side of the Santa print? They're going to be part of my Christmas Day table! A few of my favorite Santas are on display on the bottom shelf. 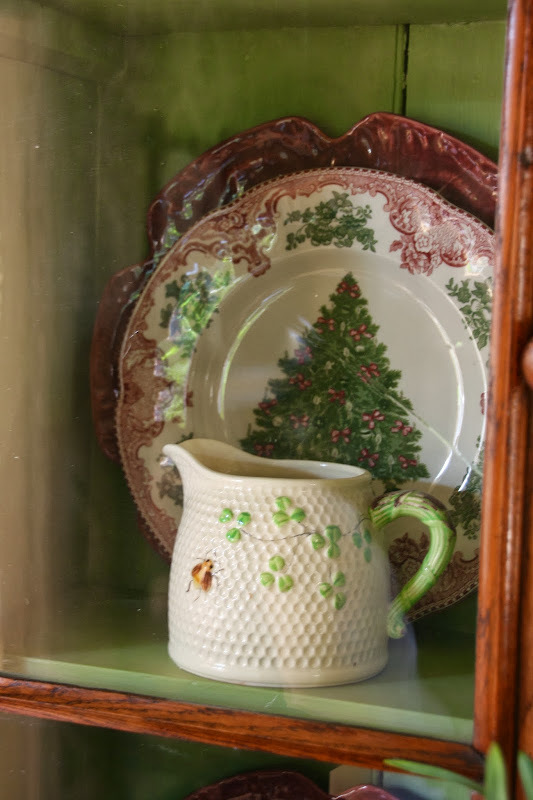 Behind closed doors, I layered Johnson Brothers' Old Britain Castles Christmas plates in front of red majolica chargers. My collection of bee hives keep the plates from falling forward and add another touch of white and green. I had my granddaughters in mind when creating this year's hutch. I wanted it to be fun and playful and very festive. I love those paper whites!!! And how you added greenery on the shelves. I'm going to the flower mart on Wednesday for the first time. So cute and I didn't remember the open shelf on the bottom. I just love that hutch. I love your Christmas Hutch! I love your hutch is so Christmasy and cozy with beautiful holiday things inside! Love the pretty C'mas print too. Seriously, you have the best dishes ever. I love to see what you do with them. Your layering is a feast for my eyes!!! So festive! I love all your Christmas hutch designs! Your hutch looks perfect for this time of year. I love the green color and the dishes are beautiful. Merry Christmas D! Love it all and the picture was a perfect jumping off point!! Love the hutch display. I think those are beautiful Magolica plates too. Very festive display. I have always loved this hutch and you have decirated it beautifully, as always! I don't remember the open shelf on the bottom!!! How did I miss that??? Have a beautiful week. Delores, your Christmas hutch is warm and inviting. 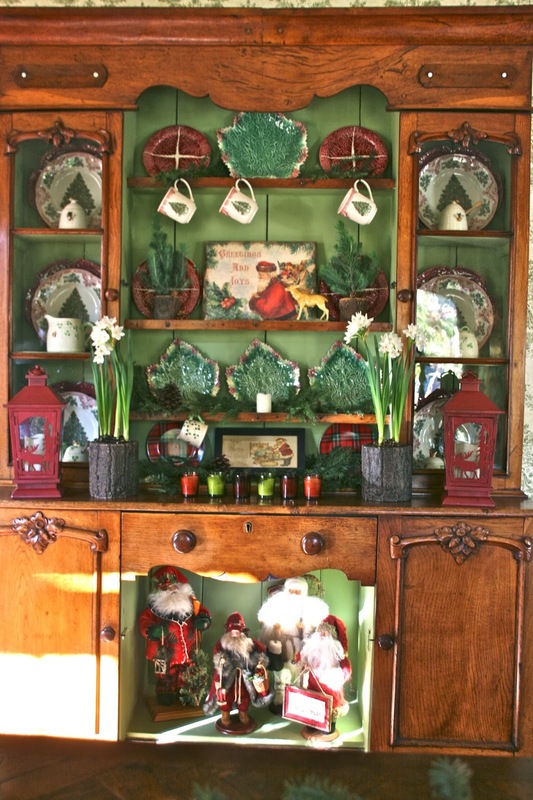 Love the mix of majolica and Christmas greens. Your granddaughters are going to be enchanted! Thanks for the visit and thoughtful comment. Happy Holidays to you and your family. So , so pretty !! It looks so warm and inviting, and Christmassey!! Your blog has become my favorite of all! I wish I had even an ounce of your talent and creativity! I have sooo many built-ins with open shelving, glass fronts shelving and I just don't even know where to begin! I look forward to your posts! Your home is beyond lovely. I love it's warmth and coziness. I too never noticed the opening at the bottom of your Welsh cabinet. : ) I always adore your transfer ware, hutch styling and tablescapes. Thank you for sharing your beautiful home, inspiration and talents with us all! So charming! You have such a great eye for the details that make it perfect without going over the top! I love everything about this. Love the texture and patterns of each piece and how they all compliment each other. You have a good eye. Oh, I just love the vintage look of your hutch, Delores! What pretty things you have. I love those green leafy plates. Merry Christmas to you and your family. Delores, I have loved your hutch since the first time I saw it on your blog. You have decorated it beautifully for Christmas. I'll bet your granddaughters love seeing the Santas in the lower section, and the little deer. Love it.